Then as Always it will be the 1st and 3rd Thursday of December to March. We thought it would be interesting to tell you all how the Muelle Market started. Hope you all enjoy the read and See You at the Market. The idea came after chatting with my friend Sharon, who has lived in Chicxulub for years and assists with many humanitarian programs in the village especially the Chicxulub Food Bank. We talked about a way to help the local artisans who handcrafted item as the fishing did not sustain the families all year. So, being a creative thinker and an artist it didn’t take long to come up with the idea of doing a market. Now it was time to start looking around for a local venue for the market. I had only been in Chicxulub for about 7 months at the time and spoke very little Spanish so I incorporated the help of Sharon and her friend Carmita. 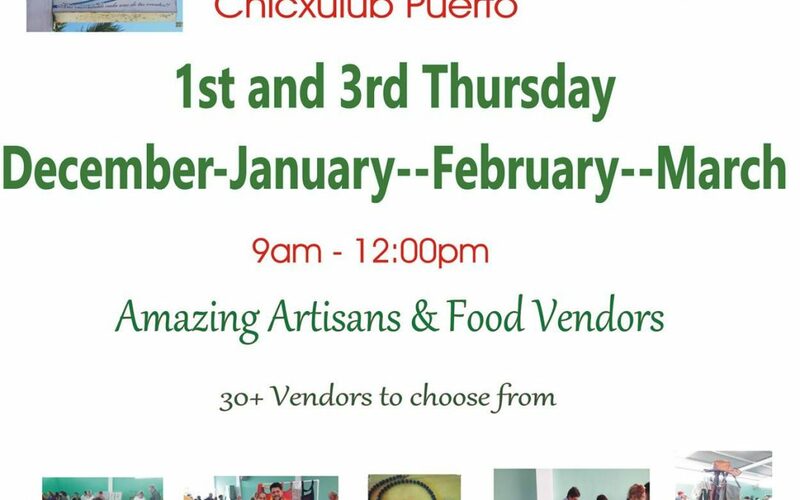 After seeing what was available, I told Sharon that I had seen a beautiful restaurant in Chicxulub Centro and thought it would be a perfect space to use for a small market. It was then that Sharon introduced me and the market idea to Charlie the owner of Bamboo Beach Restaurante which, was also the home of the Chicxulub food bank. I realized then, that I also wanted the market to somehow help raise money for the food bank. The artisans and the food bank were both quickly stealing my heart. Now that I had found a space I need a name. The name Muelle Market, came to me as I was driving to the restaurant. There is a sign just before you turn to go towards the restaurant and it says in bold letter MUELLE with an arrow pointing down the street. My first thought was, wow free advertising and directions at the same time, so hence I called it the Muelle Market. The market started off with only a few tables which I rented out for 25 pesos each and decided to give the proceeds to the food bank , as the market wasn’t about the money it was about give in some small way to this beautiful and peaceful place. The next month as I was travelling around I would see an amazing artisan and ask if they would like to come to the market. The vendors were growing but the people weren’t coming like we thought they would. My vendors had faith in me and my idea though and stood beside me through the good and the bad of the market. Then slowly the word got out to the public. The turning point was a cold day when the Norte winds blew strong and the wind and rain threatened to take the roofs off of the buildings in Chicxulub Centro, my first thought was to cancel the market as I just couldn’t imagine anyone wanting to come out in this weather. Some of my vendors asked me not to do that as they have perishable items and really needed the market to be that day. So I took a leap of faith. That day was the most incredible market day that we ever had and we never looked back after that. Now as we enter into our 7th year…. the anticipation each month for the market grows. This year we have 35+ vendors from all over the area and some from foreign countries selling everything from homemade food to hand carved art. We host a fundraiser raffle twice a month for the food bank and that helps them raise money for many social programs. The energy and the excitement of each market always brings a smile to my face and I am left humbled by this creation. The two things closest to my heart , the food bank and my beloved vendors, have benefited from this market and my life has been enriched in way I never dreamed possible. Awesome story. Thankyou for sharing.iI wish you many more years of success to all. Hi there … went to the market for the first time and thoroughly enjoyed. I noticed a vendor selling aprons for sale and wondered if I can reach her separately I would like to buy some more … if possible that would be great.